We’re only human, we’re not shielded against craving that 4 pm snack. We’ve been there, in a hurry to grab a quick, convenient bite instead of an entire meal. Let’s face it, given our bustling schedules it may practically be impossible for us to sit, plan and prep 4-5 square meals a day. So rather than opting for a greasy pack of chips we opt for what may seem a healthier alternative, a protein bar. The word “protein” slapped across any food package, seems to push it to the health food status. Just like the other labels, namely gluten free, grain free, low carb etc. this may seem like a lucrative option, when in truth we may just be falling prey to another food scam. By no means am I indicating that all protein bars are bad. If you’re comparing a bar of Cadbury to a Max Protein Bar, the latter is definitely the lesser of two evils. But why settle? The problem with some bars arises with their ingredient list. If one has 30 g of sugar and 10 g of protein, I hate to break it to you but it’s more of a candy bar than a muscle building food. Ask yourself this, strip away the minimal 10 g of protein and what’ve you got left? Yes the possibility of a convenient high protein snack sounds amazing. But the truth remains that these still fall under the category of processed foods. Some of them contain an overwhelming amount of saturated and trans fats, sugar and other artificial additives, which are masked with the addition of protein. Here’s what Harvard Health has to say. These are extremely popular in the world of protein bars. They’re nothing but reduced calorie artificial sweeteners, that offer a sweet substitute to sugar. However, they have been known to create gastric problems amongst consumers. 30 g of sugar in one serving! Even if it contains a significant amount of protein, it’s more on the lines of a dessert bar than a health food. 30 g is more than the recommended intake for added sugar for one day! 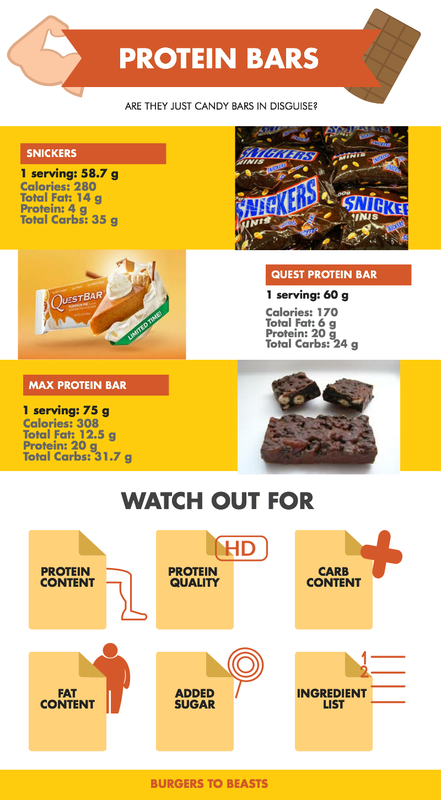 The added protein to a bar, is the main differentiator between a candy bar and “healthy bar”. A minimum of 20 g of protein is required to stimulate it’s synthesis in the body and consequently support muscle growth. So when you’re purchasing a protein bar, ensure it contains at least 20 g of this macronutrient powerhouse. As you may know, there are a number of types of protein. There’s whey, soy, casein, egg etc. Whey is one of the purer forms of protein and quite often food manufacturers dilute the whey content with cheaper alternatives, to up the protein content. Compromising on quality in the process. You don’t want a bar that’s packed full of soy. Instead, you want proteins that have the most Isoleucine, Leucine, and Valine, branched chain amino acids that will support muscle growth. It’s practically impossible to build a bar solely out of pure protein. Quite obviously other ingredients need to be added to make it a solid product. It becomes that much more important to check the label. If it contains more net carbohydrates than actual protein, it’s not really a protein bar. The added sweeteners & sugar alcohols (carbohydrates), instantly tip the bar over to the candy side. What exactly do you look for in a food? If it’s taste then that can’t be generalized. However, if its definite nutrition, then it becomes a little more intricate. If you’re looking towards a bar for the protein content solely, opt for one with a lower fat and consequently lower calorie content. However, if you’re looking for a filler/meal replacement, a 180 kcal bar won’t cut it. You’ll probably need something with a higher fat content. If you’re using a bar as a meal replacement, you should go for one that is between 300 and 400 calories. The ingredient list is ALWAYS the most important factor, in deciding whether or not to purchase a product. As explained with processed foods, the shorter the ingredient list, the fewer ingredients, the less processed and consequently the healthier it is. However, if a food item is packed with a never ending list of unfamiliar ingredients it’s extremely processed. You’d rather opt for a bar with 3 ingredients and maybe a lesser protein content than one with 3 billion ingredients and marginally higher protein content.